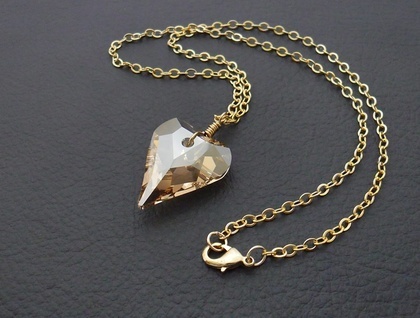 One glittering Swarovski heart pendant, in a hue called 'golden shadow', is showcased on a simple gold chain. 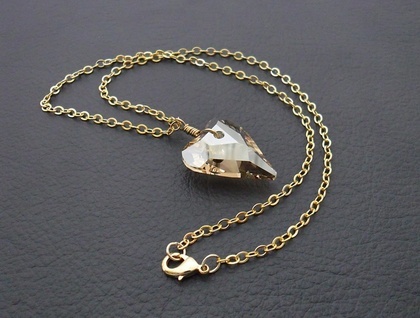 The crystal heart is wire-wrapped with non-tarnish, brass based, artist’s quality wire, and suspended on a Hamilton gold-filled chain. 'Hamilton gold' is actually brass with gold added to it, giving the rich look of gold at a lower cost. ‘Gold-filled’ – also called ‘rolled gold’ – items have a thick layer of gold bonded over a base metal. This layer is much thicker than gold plate, and accordingly lasts longer. It often has a richer shine to it than gold plate does. The necklace is finished with a high quality, gold-plated clasp with a protective coating to keep it looking new and shiny for a long time. These Swarovski crystal heart pendants vary in shade depending on the light. The ‘golden shadow’ colour can seem rich gold, pale gold, champagne, or even pale apricot in colour. These shifting hues, along with the brilliant sparkle for which Swarovski crystal is known, and the little rainbows that these crystal pendants throw when the light is right, make simple but stunning jewellery. 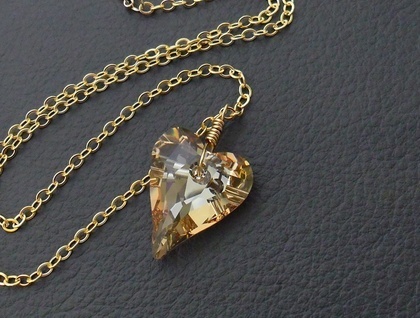 The dramatic, romantic shape of this crystal pendant is called ‘Wild Heart’. The necklace is reversible, and the facets vary from side to side, one side seeming more opaque and the other more sparkly. 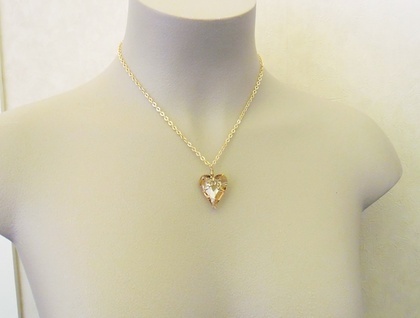 The 'Shining Heart' necklace measures 45.2cm, including the lobster-claw clasp, while the heart pendant measures 27mm lengthwise, not including the wire-wrapping, and 22mm across at its widest point. Other Swarovski heart necklaces are also available here in my Felt shop.